21 August 2017 - a day to remember! 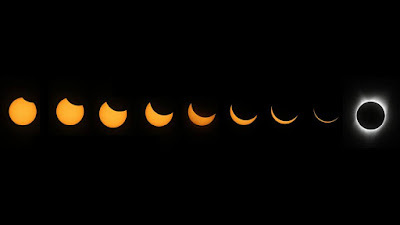 Total Solar Eclipse on the day was the talk of the country - I mean the US, where it would be visible. We were there visiting our sons during the time, naturally the excitement rubbed on to us. 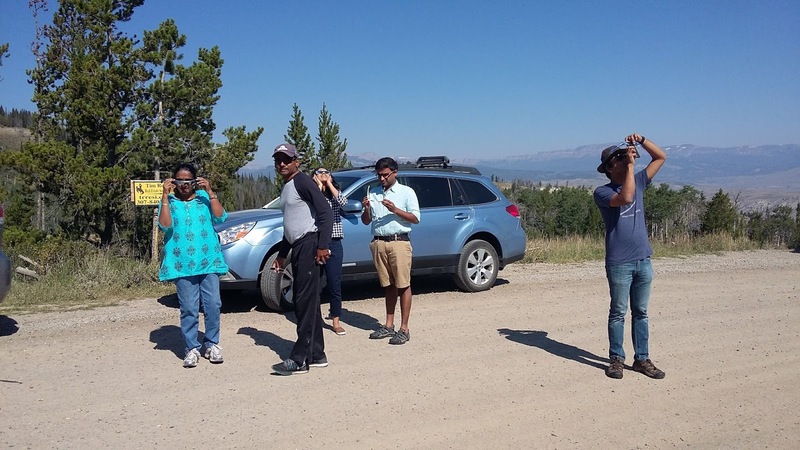 We were at Salt Lake City, Utah; the band of totality would pass through the neighboring states of Wyoming and Idaho. Our son had done all the research he could about the ideal place to drive to for the spectacular phenomenon. He had ordered solar glasses from Amazon well in advance for fear they might run out of stock. A couple of days before the much-anticipated D day, he got to know that those glasses were fake as they failed to carry the name of the manufacturer. Luckily he could rush to the city's planetarium, stand in the long queue and manage to procure genuine solar glasses. A group of friends joined us as well and we planned to go in two cars. 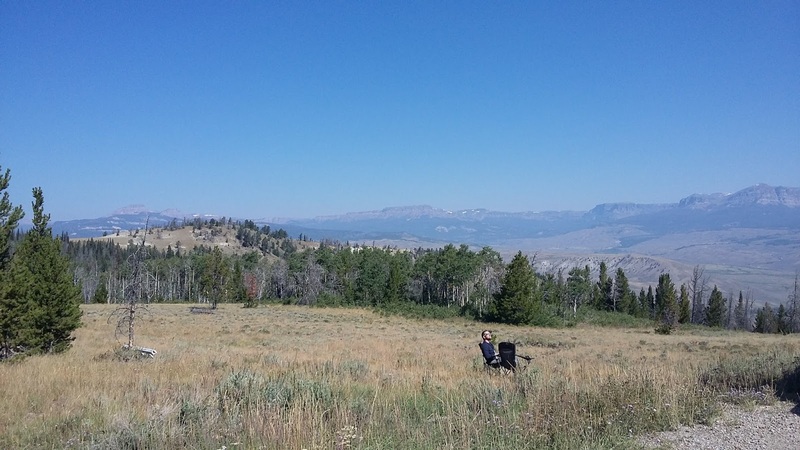 The destination was changed from Idaho to Wyoming the day before the drive due to traffic constraints. It was going to be a long drive - an estimated 6 hour driving time - if there was no traffic. With a couple of kids on board, we had to make sure there was enough stuff to entertain them too. And we planned and prepared tasty picnic baskets for breakfast and lunch. There was excitement in the air as we retired to bed early the previous night. We had to wake up at 2 am and leave home at 3 so that we could reach our destination in Wyoming around 10. Needless to say everyone was awake well in time and the cars were on the road on schedule. It was heartening to note that we didn't encounter traffic on the road - not even after dawn. Of course we saw people camping out at vantage points as we entered Wyoming state. We were at the city of Dubois at 9.30. After a few quick bites, we were ready to drive up Union Pass to find a suitable spot to witness the spectacle. As we drove higher and higher the mountain, we could see enthusiasts occupying seemingly strategic spots. We were glad we drove higher and found a great spot, where we also found some rangers and safety guards parked. It was 10.40. We put on our solar glasses and viewed Mr. Sun. Initially he was in his full glory. He looked a nice bright orange through the glasses but he was being chewed upon bit by bit by you-know-who! Some were using the special apps on their phones to get good photos. Thanks to our good friend for sharing these pictures. Mr. Sun turned into a thin crescent. The 6 year old in our group insisted that she get her jacket from the car. What a timing! But of course no one was ready to oblige - not at this crucial much-awaited moment; so the little one was shushed and distracted. 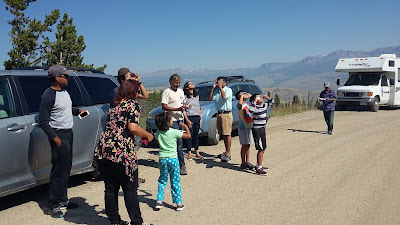 My son was waiting with great anticipation to view bands racing at 1700 mph on the ground during totality; the kids were waiting to listen to the sudden confused chirp of birds - sadly they were all disappointed. 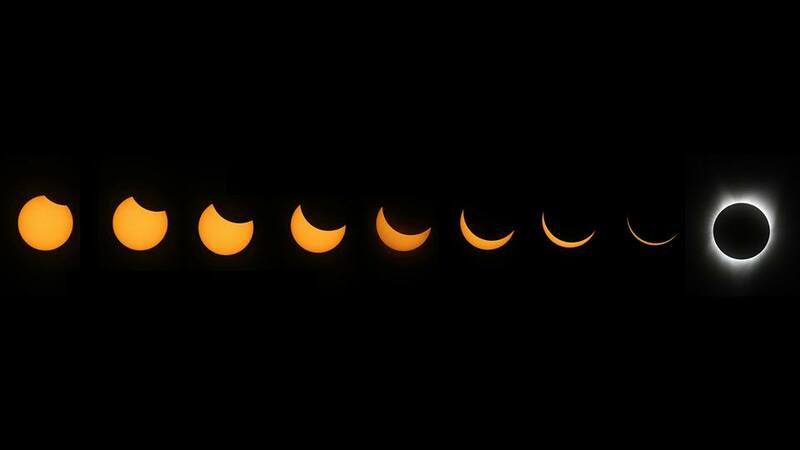 We fixed our eyes at the sun through our glasses as it was totally covered by the moon - and wow! he gradually started emerging from the shadow of the moon. We decided to drive back immediately so that we'd not get caught in the traffic jam caused by the cars returning and merging on to the highway from various points in Wyoming. We enjoyed our packed lunch while driving. But sure enough we did get stuck in traffic for a couple of hours. You know the return drive took us more than 10 hours. We reached home at 22.15 - driving for the most part of 19 hours for the awesome spectacle of just over 2 minutes! Truly worth it, of course! 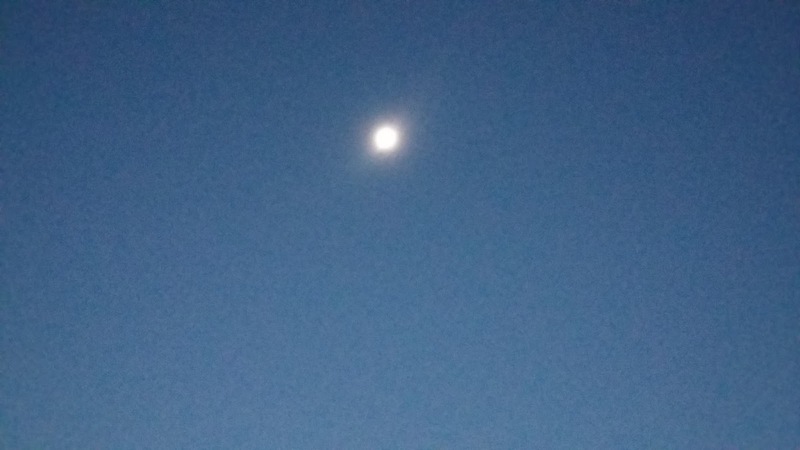 During our drive back, I couldn't help thinking about my experiences with eclipses - during childhood and in the later years. I remembered one particular experience - all of us cousins had gone to our maternal grandparents' during our vacation. And one day it was 'chandra grahanam' (partial Lunar eclipse) - my grandma explained that Rahu, the snake would devour the moon during that time. No eating, no sitting or lying down on the bed, no touching the washed clothes ... and of course no looking at the moon. We kids had a few 'Wh - Questions' for our grandparents but they were shushed down! I vaguely remember all of us sitting in a quiet corner and chatting together and listening to the radio - no TV - it was India in the late 60's. We were just waiting for the eclipse to be over as minutes seemed to crawl at snail's pace. Soon after that all of us had to line up for bath. Of course grandma was the first in line as she could start cooking only after her bath. She had stripped all the beds and pillows and cushions of their covers and soaked them in water to be washed later. Leftovers were minimal as they could not be consumed 'as the poisonous rays during the 'grahanam' would have penetrated into them'. Stuff like ghee / yogurt had been 'saved' by the addition of pieces of 'darbha grass'. We groaned and grumbled as our empty tummies rumbled - as grandma cooked up a simple meal - the steaming hot meal was the tastiest ever. Tired and sleepy and bored after the ordeal, we had to wait for the beds to get ready with fresh sheets. Man, weren't we glad to hit the bed! Grahanams later also continued in the same vein. Of course we started questioning our parents about such unscientific rituals but would again be silenced into submission. We were the generation hanging in 'Trishanku' - the 'sandwiched generation' as I'd call it - sandwiched between tradition and modernity, rather 'faith' and 'science'. We wanted to break off from norms and adhere to scientific temperament - but lacked persistence and courage. And I remember the total solar eclipse in India in 1980 - no we didn't take the kids to watch it though we had procured solar glasses. We allowed them to steal just a teeny weeny peek at the sun with the glasses on and kept them indoors thereafter. Of course the 7 year old and the 3 year old put up a resistance but were suppressed - but of course! .... And come to think of it - now in 2017, it was the '3-turned-40' who took us for the 'last-chance-in-our-life' to experience totality and we can't thank him enough!